A bold, clever murder spirals into desperate measures. A clever Agatha Christie that’s lamentably too short, The Mirror Crack’d is almost like two stories. One is the classic mystery and the other is a dissertation of sorts on growing old, especially after WWII. Set closer to the 1950s, Miss Marple is far less mobile and relies on the help of the annoyingly kind Mrs. Knight. Mary St. Mead is modernising, but not always for the better, as the townhouse style development shows. Like the last Poirot case, Miss Marple is definitely struggling with the physical indignities of growing old while her mind is still razor sharp. The mystery itself is extremely clever, a classic Christie, where golden age Hollywood meets 1950s England. An innocent woman is poisoned by mistake when a beautiful, tragic actress was the intended victim. Who tried to kill Marina – her apparently devoted husband? The cool young secretary almost certainly in love with the husband? Or one of a slew of jilted lovers, ex-husbands or cast-off children? This wasn’t my favourite book by Christie. My main complaint is how short it is – we don’t get as much chance to really dig into motives and personalities. The stakes could’ve been raised and the characters better explored with more length. But there’s always the brilliant puzzle, so painfully obvious in retrospect, to buoy an otherwise decent read. A classic British mystery blending danger, suspense and eerieness. After Traitor’s Purse, this is my favourite Campion mystery. It combines just the right amount of mystery, danger and comraderie with a spookiness that remains with you even after the puzzles are solved. The story opens with a constable handed a shilling to a poverty-stricken young man. Visible means of support was required to avoid arrest, and the constable has known the young man in his better days. Val is homeless after being estranged from his father – it is just one of Campion’s jobs to return the young man to the ancestral home. More importantly, he must protect the Gyrth Chalice that has been in Val’s family for centuries. Campion doesn’t share many details, even with his beloved servant and former burglar Lugg. If you’ve not read a Campion mystery, it is the chemistry between these two that makes the series so delightful. Campion’s amiable, vacuous personality conceals a brilliant mind. He’s inclined to make light of danger and act foolish, so the trucculent motherliness of Lugg provides a beautiful counterweight. But this mystery is a doozy and puts both of them in extreme peril. The evil people seeking the chalice could be any number of vague people. 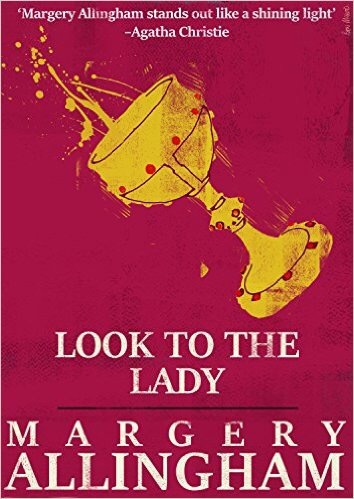 What do the priceless chalice, the death of Val’s foolish aunt, a secret society and a living nightmare have in common? These are the trials that Campion and Lugg must face, along with Val, his lovely sister Penny and a host of other well-rounded characters. In their quest to save the chalice, they must face the stuff of nightmares in a spooky old wood and survive multiple scores of violence. This book more so than even Christie or Marsh mysteries thrusts you deep into the English countryside. Somehow it takes you deep into a tiny village in the post-war 1920s while simultaneously layering in the spell of a much older England. Like our Sam Gamgee said that Lothlorien was like being inside an elven song, so is Look to the Lady like being transported into something quintessentially English. A gripping account of WWI with a tragic love story and a psychological mystery. When officer Captain Gurney stumbles into a ruined chateau, he is mystified why anyone would be playing a familiar British tune in the middle of the war. He discovers a German officer at the piano and a beautiful woman in white beside him. Both are dead. But even more mystifying is that the German officer is actually G.B., his old friend and British officer Gerald Bretherton. How did G.B. come to this eerie chateau and how did he die? Is he British or German? It is impossible to tell if G.B. is German or British until the very end. An equally good case could be made for either. The story is told from many views, including other men in G.B.’s unit and the diary of G.B. himself. The premise is excellent but I found the mystery’s solution wasn’t entirely credible, like Agatha Christie’s more obscure short stories where the ending is a pseduo-psychological phenomenon. It also became obvious where the story was heading, so the last few chapters of the book fell a little flat. A worthwhile read for the account of the war and G.B.’s tragic love story, even if the ending does not hold up on the suspense angle. It would also make an excellent movie.